For many years, I lived in south-east England just outside a place called London. You might have heard of it. One of the advantages of living in that part of the country was that it’s quite a short drive to the coastal town of Dover where you can take a car ferry across the English Channel to France. The voyage – if such it can be called – lasts a mere ninety minutes; sufficient time to enjoy a decent breakfast and a leisurely stroll around the deck. These days there’s the added choice of the tunnel which makes the trip a lot faster though far less pleasurable. I must have made that journey dozens of times over the years, sometimes just for the day to stock up on a few cases of cheap French wine and cheese. Eggs too, because for reasons I have never discovered, they tasted a lot better than the eggs available in England. Le quatorze juillet (14th July) is France’s National Day, known among English-speakers as Bastille Day, referring to the storming of the medieval fortress by disgruntled Parisians in 1789. The Bastille was an armory and state prison and a hated symbol of royalty. At the time of the attack, there were only seven prisoners inside but the fall of the fortress was the flashpoint of the French Revolution. So this is as good an opportunity as any to celebrate the work of two French composers, although there are dozens of other distinguished names to choose from. 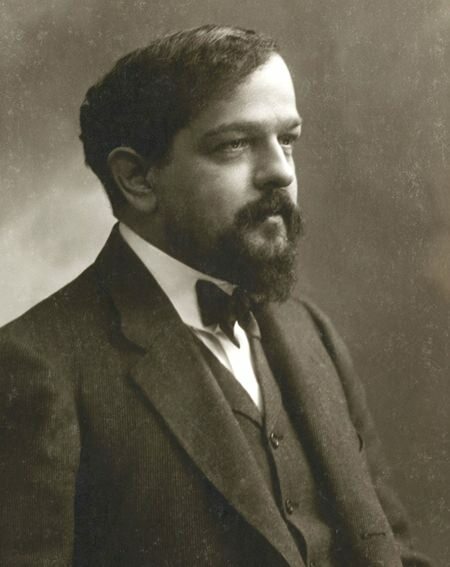 Like Laurel and Hardy or Batman and Robin, the names Debussy and Ravel are usually bundled together. In some ways this isn’t too surprising for they were contemporaries who shared similar backgrounds. They both lived in Paris and in some ways they influenced each other. Although their music has superficial similarities the composers have their own distinctive sound and had quite a different attitudes and approaches to composing. However, in these two works, both composers succeed in creating vivid images in the minds of the listeners. As a successful composer, Debussy’s music was often described as “impressionist” and although the composer disliked the description he’s been stuck with it ever since. Even so, you only have to hear the opening bars of La Mer (“The Sea”) to sense a similar diffuse and unfocused quality that so often characterizes the paintings of impressionist painters such as Monet, Pissarro or Turner. The composer was about forty when he began this impressive work. He described it as “three symphonic sketches for orchestra” and the movements are entitled From dawn to midday on the sea, Play of the waves and Dialogue between the wind and the waves. Despite the descriptive titles, the music has nothing to do with sound effects. Debussy was more interested in evoking moods through unexpected harmonies, unusual melodic lines, and surging orchestral colours. It is a masterpiece of orchestration and has become one of the most influential and popular orchestral works of the twentieth century. He started writing the work in France in 1903, completing the process while on holiday in English during the fearsomely hot summer of 1905. He stayed in considerably luxury at the palatial Grand Hotel at Eastbourne on England’s south coast. The hotel has long been associated with music. Broadcasts of light classical music started there in 1925 and were described as “music from the palm court” although few people realised that the hotel didn’t actually have one. The Grand Hotel still exists and the rooms in which Debussy stayed are now called The Debussy Suite. You can book the suite for a mere Bt. 30,000 a night. Coincidentally, Eastbourne was the place where in 1911 the English composer Frank Bridge completed a suite also entitled The Sea. Ravel invariably did things differently to everyone else and this dark and brooding waltz is a fine example of his sophisticated use of musical ideas and brilliant orchestration. He called it a “choreographic poem for orchestra” and began it in 1919. It was conceived as a ballet but these days it’s usually performed as a concert piece. Although there are unmistakable echoes of the nineteenth century, this powerful work couldn’t be more removed from the innocent melodies of Johann Strauss that so charmed the Viennese thirty years earlier. It seems more like a nightmare from a haunted ballroom. It beings quietly with ominous rumbling of double basses and cellos but gradually the tempo and intensity increase, fragments of tune appear then swirling melodies begin to emerge. There is a kind of surreal quality to the music and you might get an unsettling sense of foreboding organic growth within the music, as it hurls itself towards an almost terrifying but inevitable conclusion.